If there is an instrument that my family seems to have more than enough of it is the guitar. We have three of them to be exact. Some of us have had some practice and even lessons on this awesome instrument. Some of us haven’t made that workout. 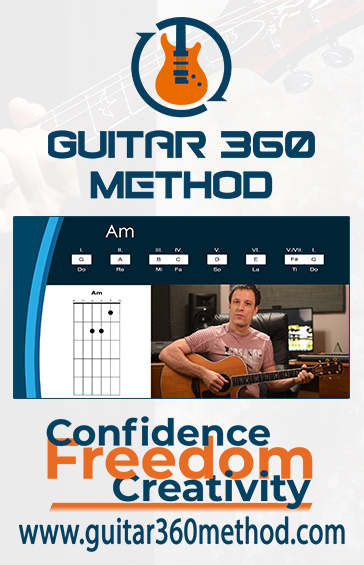 We were recently given the opportunity to solve that dilemma with the Semester 1 Bundle which also includes the Absolute Beginner Course and Bonus Songs from Guitar 360 Method. I’m glad you asked. Put simply, Guitar 360 is really well done, online, guitar lessons. We were access to the Semester 1 Bundle, which includes the Absolute Beginner bonus content and the 13 weeks of Semester 1. That is a grand total of 18 weeks of lessons if you take the week at a time pace. Of course, this is self-paced so you or your student are free to move at whatever speed best suits you. The Absolute Beginner bonus content is free and the perfect way to get your feet wet before you decide whether plunging into an entire semester is right for you. The only thing you need to give the beginner lessons a try is a guitar, acoustic or electric, either will work. The video quality of these lessons is top notch professional. This isn’t some amateur youtuber recording with their cell phone. This is a professional operation with a talented teacher. Each week’s lessons begin with a goal. You know upfront what you should be able to do, and what you should know, by the end of the week. Each week’s lesson is broken up into multiple videos that break down that goal into bitesize chunks. During these lessons you gain some ear training, you’ll have the opportunity to take online quizzes to, you’ll be given easy to read diagrams, and some lessons even include downloadable printables and files to help you along. This is a complete curriculum. Nothing has been left out. The Beginner’s Course and the Semester 1 course is jammed pack with everything from the very basics to theory. Along the way you’ll be encouraged because you will actually learn to create great music. Chords, strumming, fingerstyle, picking, theory. It’s all here. How We Used this Course? I was so excited to get this program. Many ages ago I had the opportunity o take guitar lessons as an elective in high school. and I have subsequently forgotten absolutely everything I ever learned. I started out at the baby beginner course and I realized I will have to move more slowly through this than I had hoped. Not because I can’t understand the material. That part is easy. My FINGERS! I need to gain some strength and roughen up the pads of my fingers. I’m making progress though and I’m excited. I also had my son’s following the lessons. They did not need to start at the beginner level as they’ve had some experience. I think this is perfect for a motivated Middle School aged child or older to work through on their own. A child who is younger might need a parent nearby to help clarify and motivate. I love this! It’s so well done! Everything from the video quality to the musical and guitar theory are top notch. 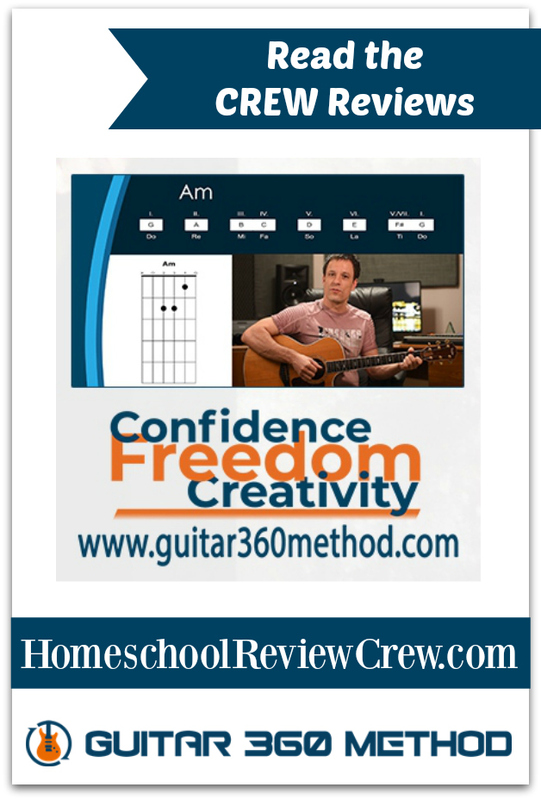 If you are looking to learn the guitar at home, at your own pace, this program is really for you! Guitar Center is offering homeschooling families reading this review 20% off at checkout when you use the code HOMESCHOOL20. Want to read even more about Guitar 360? Visit them on Facebook , Twitter , or Instagram. And see what other Homeschool Review Crew members thought of the program by clicking the banner below.